I'm Here. I'm Queer. What the Hell do I read? : In Challenge, Opportunity: News About My Book, THE QUEER HISTORY PROJECT: NO WAY, THEY WERE GAY? In Challenge, Opportunity: News About My Book, THE QUEER HISTORY PROJECT: NO WAY, THEY WERE GAY? It needs a new, brave publishing home. 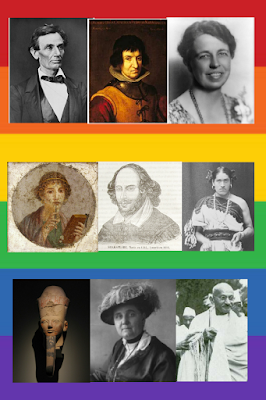 A nonfiction book for kids about men who loved men, women who loved women, and people who lived outside gender boundaries in history was bound to be controversial. Not so much the primary sources, or the facts (all of which have been published for adults before), but the daring to share it with kids. Daring to share the 1911 love contract between Mohandas Gandhi and the man he loved, Hermann Kallenbach, where they pledged “more love and yet more love… such love as, they hope, the world has not seen” between them. Daring to share the circa 1899 poem Jane Addams wrote about the “delivering love” of Mary Rozet Smith. To put this book out in the world (and into schools, and libraries, and bookstores, and kids’ hands) requires a publisher that’s going to be behind both it and me 100%. It has become clear that THE QUEER HISTORY PROJECT: NO WAY, THEY WERE GAY? didn’t have that support at Simon & Schuster, so I’ve taken it back. Now, my book needs to find a new, brave, and excited-to-share-this-project-with-the-world publishing home. So it can change our view of history, our vision of ourselves, and our dreams of what’s possible. So it can change lives. The Queer History Project: No Way, They Were Gay? Nine of the featured men who loved men, women who loved women, and people who lived outside gender boundaries in history. How many can you name? How many of their surprising – and true – stories do you know? Lee, I'm so sorry to hear about Simon & Schuster failing to show support for your book at the last minute and the need you feel to take it elsewhere. They seemed so enthusiastic about it when they accepted it; one has to wonder what changed. The true stories you share about historical figures are important for teens to know. For gay and transgender young people, they can see that they are not alone and, despite their differences, they can still accomplish great things in the world. I am hopeful that you will find a good publisher for this work--a house that values tolerance and understanding and realizes what a worthy contribution your book is. So sorry about this. You will find a much better situation. I have complete faith your book will get out there because we all need to read it. Fascinating stuff. What about Candlewick? They published Beyond Magenta. Lee, you may have already contacted them, but would the Trevor Project have any contacts you could use? The book certainly supports their mission. You might also try — and this is a lounger route — contacting librarians and county school book buyers to get commitments/statements of intent-to-purchase to prove the book's economic viability. Ultimately publishing is a a business. Whether through awards (prestige) or actual hard-number sales, books must prove that they are viable products. You could show them numbers that might tip another buyer/publisher in your favor. Lastly, (and also requires work) do an analysis of the high-risk books and figure out of there are certain editors/houses that take risks more often. I myself found surprises just in your write-up (Ghandi!?) so the book certainly got my attention. Lee, I'm discouraged to read this, but proud that you withdrew your book in order to find a publishing home that will support and promote both it and you. Did you consider McSweeney's? This book must get into readers' hands. It will let some know they are not alone and let others know the world is more expansive and inclusive than they think. Wishing you and your book the right home . . . and soon.